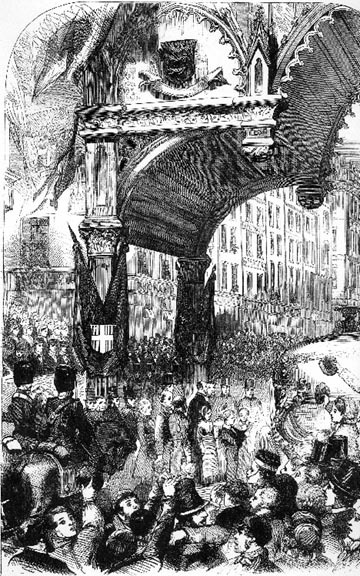 A new feature was introduced in the November show of this year by the erection of a triumphal arch in Cornhill, under which the procession passed, on Lord Mayor's day, on its way from the Guildhall to Westminster. Here the procession paused a short time whilst the children of the Cornhill and Lime-street Ward Schools advanced and presented to the Lord Mayor, who has for some time past acted as president of the schools, an address thanking him and the Lady Mayoress for the kind support they had rendered to the schools. His Lordship, having received the address, said a few words of encouragement to the children, and the procession proceeded on its way to Westminster. The present Lord Mayor is, we should add, Alderman of the ward of Cornhill. The arch, which was a Gothic one, had a triple head; the angles were carried on pilasters with carved caps; and above the arch were gables filled with tracery and flanked with pinnacles, being ornamented with crockets and finials. Along the top ran a traceried balustrade, and behind rose a high spire, with more crockets and finials, and hanging flags. Against the corner piers were groups of flags and spears; whilst the City arms and those of his Lordship were scattered about the structure. The arch was erected and painted by Mr. Fenton, under the direction of Mr. Bunning, the City architect.